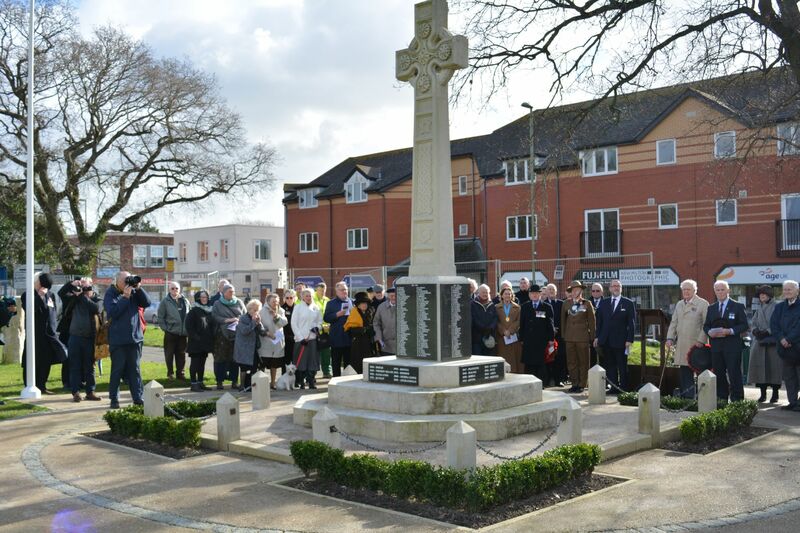 On the 23rd February 2017 a 100th Anniversary commemorative paving stone dedication took place at New Milton War Memorial in honour of Major George Campbell Wheeler Victoria Cross (VC) (2/9 Gurkha Rifles). In August 2013, the Communities Secretary Eric Pickles announced a campaign to honour Victoria Cross recipients from the First World War. Commemorative paving stones were to be laid in the birth place of VC recipients to; honour their bravery, provide a lasting legacy of local heroes within communities and enable residents to gain a greater understanding of how their area fitted into the First World War story. The intention was for each stone to be laid on the 100th anniversary of the action for which the VC was awarded. In this way, each event will be specific to the individual being commemorated and the events around the country will be spread across the four year period of the centenary. 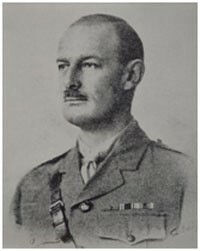 ‘George Campbell Wheeler, Major, 2/9th Gurkha Rifles (GR), Indian Army. For most conspicuous bravery and determination. This officer, together with one Gurkha Officer and eight men, crossed a river and immediately rushed the enemy’s trench under heavy bombing, rifle, machine-gun and artillery fire. Having obtained a footing on the river bank, he was almost immediately afterwards counter-attacked by a strong enemy party with bombers. Major Campbell Wheeler at once led a charge with another officer and three men, receiving a severe bayonet wound in the head, but managed, in spite of this, to disperse the enemy. This bold action on his part undoubtedly saved the situation. In spite of his wound, he continued to consolidate his position’. On the 23rd February 2017, on day battered by storm Doris, a small but moving Dedication Service was held to honour Major George Campbell Wheeler VC 2/9GR. The Ceremony was to have been opened by the Mayor of New Milton Town Council, Cllr David Hawkins who was unavoidably called away allowing Cllr Geoff Beck, Chairman of the New Forest District Council to welcome the members of the Royal British Legion, general public with a special mention to a strong representation from the Gurkha Brigade Association attending the service. The Reverend Andrew Bailey led the Dedication Service with Turner’s ‘Tribute to a Gurkha’ and the Gurkha Prayer before Lance Corporal Khushiman Gurung (from the Band of the Brigade of Gurkhas) sounded the Brigade Call followed by the Last Post. 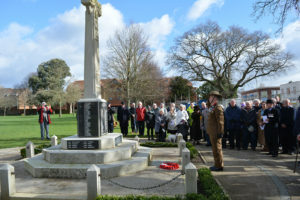 During the minutes silence, Colonel Ron Back, Chairman of the New Milton Branch, Royal British Legion recited the ‘Ode the Fallen’ (Laurence Binyon), followed by Councillor Geoff Beck who read the moving Kohema Epitaph. The Brigade Call followed by the Reveille brought the assembled participants back to the present. Colonel James Robinson, Colonel Brigade of Gurkhas laid a Brigade wreath on behalf of the Brigade of Gurkhas and Gurkha Brigade Association. Mr Bruce Roberts (last Chairman of the 9th Gurkha Rifles (GR) UK Association) laid a 9 GR Wreath on behalf of the 9 Gurkha Rifles Association. Captain Milanchandra Rai and Lieutenant David Carter 2 Royal Gurkha Rifles (RGR)laid an RGR wreath from the Commanding Officer and all ranks 2 RGR. Following the final prayer and blessing, the service was concluded by a lament played by Rifleman Padam Rai 2 RGR. You can find out more about the history of Gurkhas by visiting the Gurkha Museum located in Winchester.